This online course takes a deep dive into the psychophysiology of trauma. Experiential activities are practiced to help participants understand how mind body skills become a language for self-awareness, centering, expression and great insight into helping traumatized youth see themselves as survivors. Participants learn how to rate symptoms and reactions while teaching grounding skills. Mind-body skills highlighted in this training include: breath work, focused awareness, guided imagery and expressive arts. Click this link to see the first video segment of this online course. The course consists of video segments of a live presentation, reading and test. 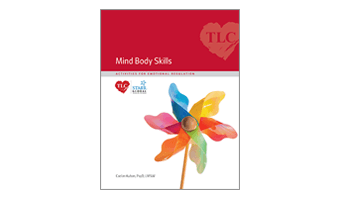 A downloadable pdf of the 125 page Mind-Body Skills Guidebook is included as well as CEs. The learner will be able to name the key components of the trauma cycle from activation to balance. The learner will understand the main concept of the polyvagal theory. The learner will be able to discuss at least 3 benefits to using movement in trauma intervention. The learner will provide examples of how the “FREEZE” response can help trauma survivors. The learner will name at least 5 interventions for grounding. The learner will differentiate between feelings and sensations. This course takes approximately 6-hours to complete. You do not have to complete it in one sitting. Once you purchase this course you will have access to it for 1-year (365 days). You must complete it in that time period. You may renew it for another year for an additional fee if necessary.